This video shows an example of how to create different workspaces for analyzing different instruments, place trades and analyze the market. Learn about the advantages of ProRealTime, including top quality charts, technical analysis, data and trading tools. You can save different templates and quickly switch between them. You can also save your work with the "File" > "Save" option. Help and support tools are available directly from the platform via the options in the help menu. Charts can be easily opened using the instrument search tools and lists in the platform. You can zoom into or out of charts using the magnifying glass tools at the bottom right. You can also choose to zoom on a specific time period by choosing the beginning and ending times. Multiple charts can be opened and linked to eachother so that when the financial instrument of any given chart is changed, any linked charts are also changed to display the same instrument. The chart settings window can be opened by clicking on the wrench key in the lower right part of each chart. The video provides details about the available options. Chart styles can be modified by clicking on the wrench in the title of the price chart. More than 15 styles are available including charts based on time, price movement and volume. How to open and use lists, customize columns displayed and column order and sorting criteria. Quick search is available in the main window and at the top of each chart. Results are provided as you type and can be directly clicked. The search tool can also be customized. Advanced search lets you search for financial instruments by keyword or by market. Search results can also be filtered and sorted. 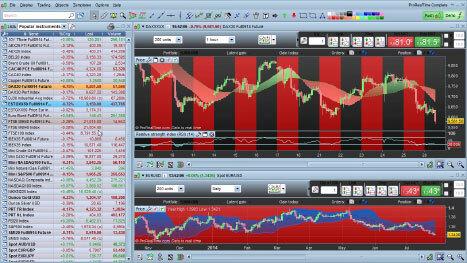 Indicators can be added using the add indicator button at the upper-right of charts. 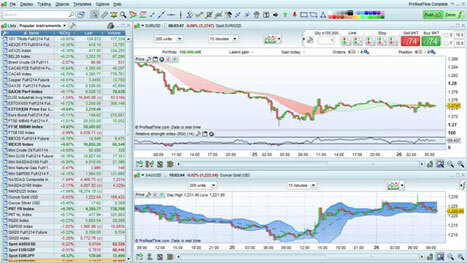 Indicators can be configured by clicking on the wrench in the indicator's title or the price chart's title. Indicators can be added on other indicators by clicking the wrench icon in the title of the first indicator, then choosing "Add indicator". This method can also be used to add indicators on the price chart. Multiple instruments can be compared on a single chart by adding the "Compared security (on price)" indicator to any chart, then choosing the instrument to compare. Three different scale types are available. 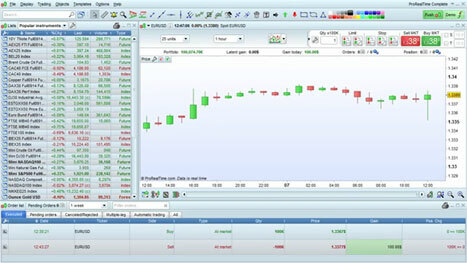 Indicator panels and the price panel can be moved and resized on your charts and also maximized and minimized. Color zones can be added to indicators or modified by clicking the wrench icon in the indicator's title. Indicators, trading systems, and market scans can be marked as favorites to access them more quickly. How to draw objects on charts in ProRealTime. Many different types of drawing objects are available for use. How to customize the cursor, use the cursor details window and some cursor tricks with the ProRealTime trading and market analysis platform. How set drawing options and use drawing assistance. Activating drawing assistance makes your lines automatically stick to important points while you draw or move them such as open, high, low or close prices. The text tool lets you add text directly on charts. Text added to charts is shown only on the time frame where you originally added the text. Comments are shown below the chart and displayed on all time frames. How to view orders and positions in ProRealTime and place orders. Orders can be easily placed directly from charts, the order book, alerts and order tickets. Both real and papertrading accounts are available. How to place multiple-leg orders from charts such as a main order associated to a stop order and a target order. The order placement interface and trading options can be customized from the "Options" > "Trading options" menu. The portfolio and order list windows can be opened from the "Trading" menu and used to monitor your positions and orders and also quickly close them. Simple and multiple leg orders can be placed from the order book. You can also move and delete orders from the order book. Fonts and colors of the platform can be customized from the "Options" > "Template options" menu. Time zones and trading hours can be customized form the "Options" > "Platform options" > "Time zones and trading hours" menu. Time zones can be the same for all charts or customized market by market. You can create custom indicators with ProBuilder which is a simple programming language created by ProRealTime. Adding dynamic variables to your indicators lets you modify these variables from the indicator properties window without modifying the program (for example: number of periods of a custom indicator). 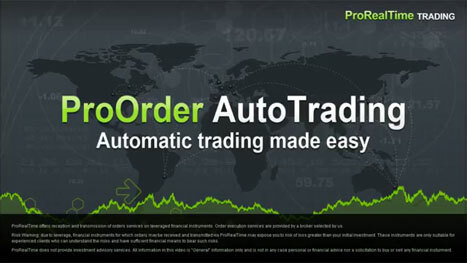 ProOrder is ProRealTime's automatic trading module. Trading systems can be created either with or without programming and be used with both simulated and real trading portfolios. How to easily create a trading system without programming. How to run and analyze a trading system backtest and also export the results. How to use ProBacktest optimization to find values of variables that give the best results for a strategy for a given financial instrument and period of historical data. Trading systems can be easily added to ProOrder and started from the chart, or the list of your trading systems, or from the programming window. How to scan entire markets based on your own chosen criteria. 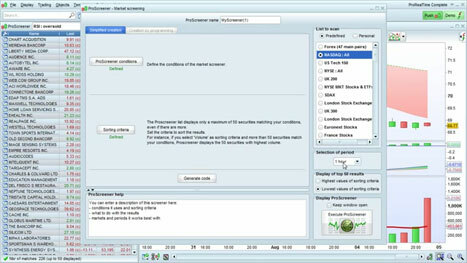 ProScreener scans can have multiple conditions including conditions based on different time frames. The top movers tool scans the market based on predefined criteria such as price (highest winners or losers) and volume. Different time frames for the scan are also available (ex: since yesterday, since 1 hour). The candlestick pattern detection tool scans entire markets to find instruments which show popular candlestick patterns on charts. 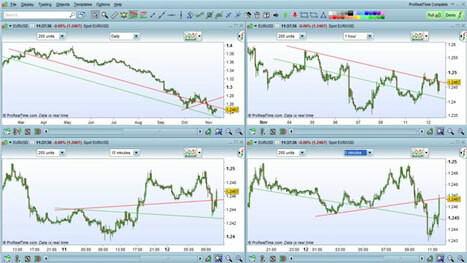 How to use the ProRealTrend module to automatically draw trend lines on financial charts in the ProRealTime. ProRealTrend detection scans entire markets to find financial instruments close to support and resistance lines and also chart patterns such as channels and triangles. 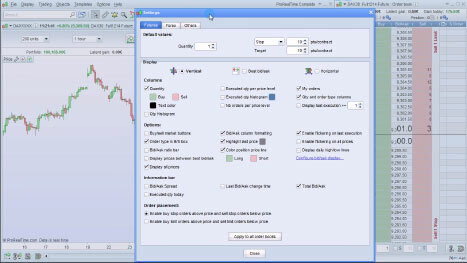 ProRealTrend options can be opened from the "Platform Options" > "ProRealTrend lines" menu. You can set options such as line density, display, and colors. Programs such as indicators, trading systems and screeners can be imported and exported to share with your contacts. Charts can be saved and printed using the print and save tools at the bottom-left of each chart. You can customize the image size and print multiple charts. Charts can be shared via popular social networks such as Facebook and Twitter. The spreads tool lets you create charts that display differences in price between different financial instruments on a chart. X-tick charts display candlesticks based on number of transactions instead of time and offer an alternate way to analyze the market. The tick by tick list shows a list of transactions for a given day with time, price and volume data. Warning: ProRealTime does not provide any financial investment advisory services. All information on this site is "General" information only and is not in any case personal or financial investment advice nor a solicitation to buy or sell any financial instrument.